The Miss Global International Pageant is held annually on the beautiful island of Jamaica, at the Grand Palladium Resort & Spa. This year the Jamaican Tourist Board invited media from around the world to attend the week long festivities associated with the 2011 Miss Global International Pageant. Miss Global International previously known as the Miss Common Wealth Pageant for the past six years, was the brain child of Pageant Director Mr. Lachu Ramchandani who wanted to incorporate women from all over the world in the ultimate International Beauty Pageant. To date, Jamaica has hosted the largest beauty pageant known to the Caribbean, and continues to be one of its most beautiful islands . We were able to spend an exclusive week with beautiful women from countries like Australia, UK, Czech Republic, Bahamas, Malaysia, Belgium, Nigeria, Cuba, St. Marten, Cape Verde, Russia, Zimbabwe and more….all while experiencing the glorious country of Jamaica. 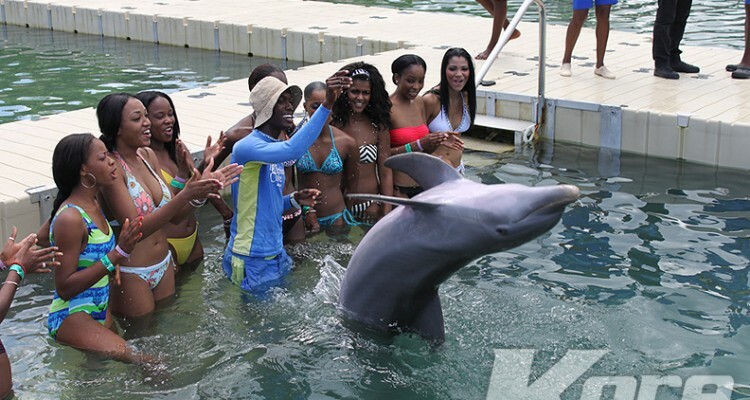 The Contestants of the Miss Global International 2011 had the wonderful opportunity to swim with the Dolphin’s at one of many tourist locations in Jamaica. Dolphin Cove is located just down the road from the luxurious Grand Palladium Resport & Spa, and features activities like swimming with Dolphins, riding the Camels and Sting Rays. The chipper staff at the Dolphin Cove will help to keep you educated about marine life and better prepare you for your stay in Jamaica!!! The Jamaica Zoo is located in the St. Elizabeth parish close to the Black River, just at the end of the world longest bamboo covered road. If you’re are planning to visit Jamaica you must visit their cozy wild life facility, and take an opportunity to experience the true exotic nature of Jamaica.